MILLIGAN COLLEGE, TN (Oct. 24, 2013) — Milligan College alumnus Brian Talty will speak in Milligan’s convocation service on Tuesday, Oct. 29, at 11 a.m. in the Mary B. Martin Auditorium of Seeger Memorial Chapel. Talty is the spiritual development pastor of First Christian Church in Decatur, Ill. He graduated from Milligan in 2003 with a bachelor’s degree in Bible with an emphasis in youth ministry. He will deliver a message titled “The Why Behind Your What,” based on the biblical text from Matthew 6:1-4. 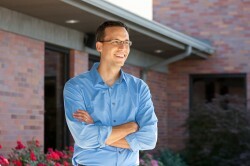 In addition to serving at First Christian, Talty hosts a blog titled “Ministry Productivity: Life, Ministry, and Getting it All Done,” at www.ministryproductivity.com. Posted by tommy on October 24, 2013.